In his post-match interview, David Moyes called the refereeing scandalous – the match was officiated by 2010 World Cup Final ref, Howard Webb – specifically referring to a penalty he believed should have been awarded in a challenge between Ashley Young and Hugo Lloris which saw the French keeper beaten to the ball on the edge of the box and the England winger went tumbling. The replays suggested there was some contact, though also that Young was already on his way down, and while I have definitely seen penalties given for less – especially for United at the Stretford End at Old Trafford – it was far from the “stonewall” decision that Moyes suggested. (However, at some point this season I do expect that Lloris, who has a tendency to come rushing out of his area and has already been caught out a few times, will see red as he continues to ride his luck.) Of course what the new man in charge of United was displaying was that, while he has not found a way to grind out wins and keep his team in the top 3 of the Premiership, he has learned one skill from his predecessor, as Sir Alex Ferguson was an expert in deflecting attention away from negative results. Moyes is getting plenty of experience of doing that at least, as he has seen his side lose four times already at Old Trafford this campaign, more than any season since 2001/2 when they ended up third, their lowest ever finish in the Premiership era. Currently, United sit in seventh place, five points outside of the top four and eleven behind the leaders, Arsenal, who maintained their position at the top with a hard-fought 2-0 victory over Cardiff. The Welsh side, who have just appointed Ole Gunnar Solksjær as their new manager, held the Gunners at bay until the 88th minute, but Wenger’s men finally broke through thanks to a strike by Nicklas Bendtner, who was subsequently forced off due to an ankle injury, and they sealed the points moments later with Theo Walcott providing the finish after Jack Wilshere’s clever pass. A point behind Arsenal in second are Manchester City, who continued to improve their form away from the Etihad with a 3-2 victory at Swansea, with their goals coming from Fernandinho, YaYa Toure, and a lovely solo run and finish by Aleksander Kolarov. It was the first Premiership win in Wales for Manchester City, but the result was harsh on the home side – both of whom’s goals were scored by Wilfried Bony – as they put in a strong performance and probably deserved at least a draw. A further point back in third place in the table are Chelsea, who ran out 3-0 winners away at Southampton with all of the goals coming in the second-half, following the substitution of Juan Mata – who displayed frustration at the decision to be taken off and who might be on his way out of the club during this transfer window – and the introduction of Oscar and Willian, both of whom scored to add to Fernando Torres’ opener. Liverpool, who had suffered defeats away at Manchester City and Chelsea in their previous two games, moved back into the top four with a 2-0 victory at Anfield against Hull, with their second coming from a spectacular free-kick by Luis Suarez, who took his tally in the Premiership this season to 20. The Reds moved ahead of their local rivals Everton, who had to dig deep to claim a draw away at Stoke, equalizing only in injury time through a Leighton Baines penalty after Oussama Assaidi – who is on loan to the Potters from Liverpool – had opened the scoring. Newcastle United dropped back in the race for European qualification with their second consecutive 1-0 loss, this time falling to West Brom who got all three points courtesy of a late penalty converted by Saido Berahino. In the battle to avoid relegation, Fulham claimed a big win and moved out of the relegation zone with a 2-1 victory over fellow strugglers West Ham at Craven Cottage. The Hammers had taken the lead early through Mohamed Diame, but by half-time Fulham were level and the visitors were down to 10 men when Kevin Nolan was sent off for the second time in a month, this time getting dismissed for an off-the-ball kick at Fernando Amorebieta. The defeat sees West Ham languishing in 19th place, three points from safety and in desperate need of new recruits in defense and up front this January if they are to have any chance of avoiding their third relegation in the Premiership era; while Fulham are now in 16th place and a home win against Sunderland in their next Premiership fixture (on January 11th) could propel them into the middle of the pack as they are only four points behind 10th place Hull. On New Year’s Day, the Black Cats were beaten 1-0 at the Stadium of Light by Aston Villa, with Gabriel Agbonlahor scoring the only goal; while the other match between two strugglers, Crystal Palace and Norwich, ended 1-1, a result that saw the Eagles drop back into the relegation zone. Is he going to have a crack? He is you know! This weekend is the FA Cup Third Round weekend, which means the only thing fans of English football can do is wax lyrical about the magic of the competition, but I did that a couple of years ago, so you can read that here. Unfortunately, in the current finance-obssessed climate the biggest teams are most interested in challenging for Champions League places rather than prioritizing the possibility of winning the FA Cup, so the competition has suffered in prestige terms over the last decade or so. Nevertheless, it is still a great tournament for the supporters who can get excited by a cup run and although it is normally the potential upsets that are the most interesting, the standout tie this weekend is the North London derby between Arsenal and Tottenham. 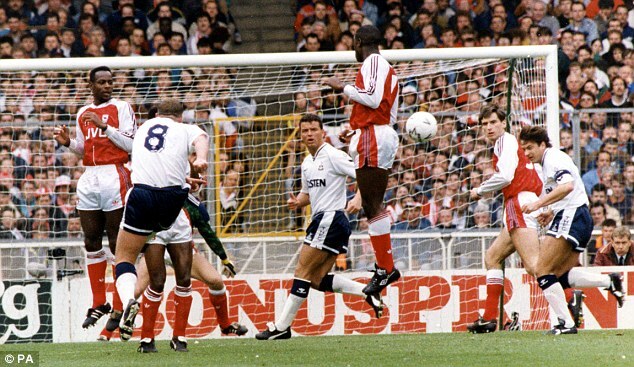 When I turned 10, Spurs had won the FA Cup twice in my lifetime (1982 and 1991) and eight times in their history, in the subsequent 23 seasons they have won it…zero times. En route to the 1991 success – the only one I remember since I was less than a year old the other time they lifted the trophy when I was alive – Tottenham beat Arsenal in the semi-final, the first to be played at the old Wembley stadium and a game that saw a cracking free-kick by Paul Gascoigne and two goals by Gary Lineker. Since then, there have been no finals, no other trophies save for two League Cups and two semi-final defeats to our old rivals – but the draw sending Spurs to the Emirates in the third round was cruel misfortune in the hopes for a lengthy cup run and the odds are, it will be an early exit for the white half of North London once again this season. It is hard to predict which of the other 31 ties will be the standout one of the round, it is likely that there will be an upset somewhere or other, especially with bad weather across the country likely to lead to some dodgy playing surfaces on the ties that are not postponed. One fixture that did stand out to me was Charlton vs Oxford, as I have seen both teams play in the FA Cup live: Charlton were the closest team to where I lived in London so I went to their match against Exeter, thankfully skipping the trip down to Southampton to watch Tottenham lose 4-0 later in the day; and I saw Oxford take on Leeds in 1992, when my cousin was playing for the away side and scored in their comeback from 2-0 down to force a replay, though Oxford prevailed at Elland Road. However, that game has already been postponed due to a waterlogged pitch, so other ties that could be exciting include Harry Redknapp taking his QPR team to Everton; Manchester City face a Lancashire derby away at Blackburn; Solskjær’s first game in charge of Cardiff will be at Newcastle; and the lowest ranked club left in the competition, Macclesfield, take on Sheffield Wednesday from the Championship.